Police are warning residents of two men carjacking drivers in Chicago's Austin neighborhood. 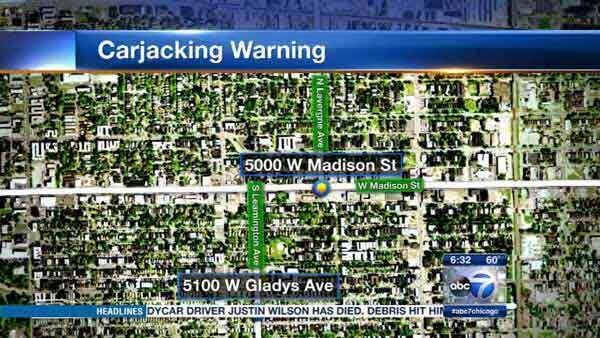 CHICAGO (WLS) -- Police are warning residents of two men carjacking drivers in Chicago's Austin neighborhood. Authorities said two drivers were robbed in separate incidents in August. Two men robbed each victim at gunpoint and stole their vehicles. The first carjacking occurred in the 5000-block of West Madison Street around 12:30 a.m. on Aug. 10. The second carjacking occurred in the 5100-block of West Gladys Avenue around 4:20 a.m. on Aug. 14, just blocks away from where the first victim was robbed. The descriptions of the thieves are vague, but officers said anyone driving in the area should be on heightened alert.